There are countless genres of video games in today’s market, yet one of the least represented is the 4X strategy game: explore, expand, exploit and exterminate. “Sid Meier’s Civilization” series has a long running history as the genre’s poster boy, and this holds true in “Sid Meier’s Civilization 6,” referred to as “Civ 6.” First released on Steam on Oct. 20, 2016, “Civ 6” received a port to the Nintendo Switch on Nov. 16 2018. The premise is right there in the title, with the player taking control of a real-world civilization throughout humanity’s history. There is a lot to unpack for 4X games, and “Civ 6” is no different. The player is presented with a randomly generated map, with their actions going off a turn-based system. No matter what they do in their turn, they always generate resources: food and production are the bare-bones requirements to one’s growing empire. With them, cities grow larger and the player can make things faster. Faith and gold serve as an on-demand resource and can be spent by instantly converting into production or in the purchase of specific units. Lastly, science and culture act as a long-term generation of ideas that can lead one to discover new tools, enact new policies and propel their cradle of civilization on toward the stars. Managing one’s turn-by-turn income of these resources and forming plans around said resources is at the heart of every game. The player is not alone in this journey through history, though. Other civilizations can appear as neighbors, and they are equally capable of being a rival or as an ally. Each civilization possesses unique bonuses that fit certain playstyles, so one must choose wisely and consider what their neighbors are capable of. One is certain to make enemies, so remember the importance of a military. Grand cities and huge investments will mean nothing if they fall into the enemy’s hands! 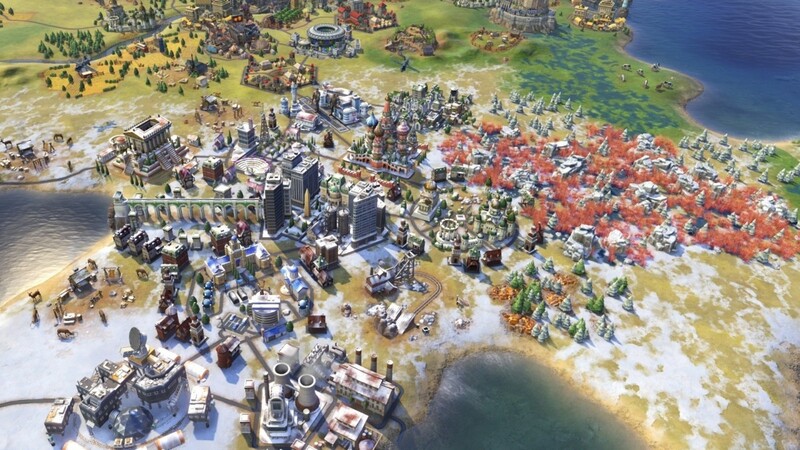 “Civ 6” also introduces new ways to playing the 4X genre. A city without its infrastructure will sooner or later fall behind, and to keep up one will need to construct districts. Each one occupies a space on the map, and careful city planning can result in higher yields for each district. Once one is constructed, the player can build specialized structures that complement its district. For example, a campus can improve one’s sciences. If there is one truly bad thing to say of “Civ 6,” it is how it was marketed. Much of “Civ 6’s” spotlight has been plagued with its poor handling of downloadable content, offering one or two new leaders for prices comparable to whole expansions. This may come off as a good thing to someone who does not want to play as all the leaders, but it is an offense to a fan of the series. Thankfully, this problem is answered in the Switch port, with several packs automatically unlocked: but, there are still day-one downloaded content packs. Overall, “Sid Meier’s Civilization 6’s” new port to the Switch proves to be a notable addition to the console’s library. Its port proves to be a serviceable recreation to the original, with no noticeable drops in controls or in quality. Each standard game of “Civ 6” can be expected to take five to eight hours, but with near indefinite playability, it can easily last through all of one’s spare time with the promise of just one more turn.